With an objective of spear heading skill development activities between Europe and India through effective collaborations involving training providers, policy makers and global institutions, the EIFE is embarking upon a path less travelled. 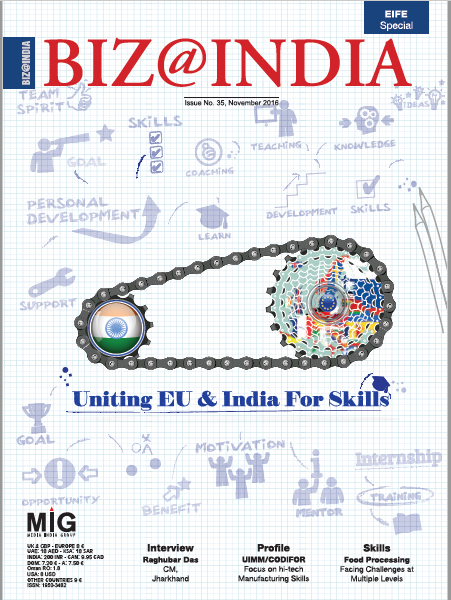 As India embarks upon its ambitious mission to provide skills of all sorts to over 500 million of its youth in the next 10 years, it is seeking assistance – technical and financial – from various global institutions and countries with experience in skill development, notably the EU nations. Realising the opportunity that it offers in bringing together the professionals and policy makers in skill development in Europe and India, the Europe India Foundation for Excellence has mounted an ambitious international conference & exhibition on skill development. Founded with the objective of promoting greater collaboration between the two continents in skill development, education, and Research and Development, the EIFE acts as a platform to bring together the right public and private partners in the area of skill development, and promote the idea that diaspora is an integral part of a nation’s wealth and it can play an important role in promotion of innovation and excellence. 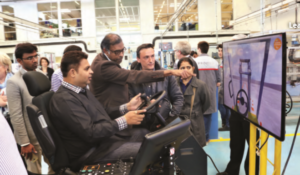 Earlier this year, in May, the EIFE, along with the UNESCO and the OECD, organised the ‘Global Skill Development Meet’ at the UNESCO headquarters in Paris to create awareness about the skill development scenario in India. The conference was attended by about 175 skill development professionals from France, Germany, Switzerland, United Kingdom and India. The meeting focused on areas of collaboration such as EU providing assistance to India in training the trainers, in upgrading its curriculum & certification as well as the technology and methodology of training imparted in India. The immense challenge of training the youth in India was raised by Abhishek Mishra, Minister of Vocational Education and Skill Development Mission, Government of Uttar Pradesh. He highlighted that India was the youngest large nation in the world and being the most populous state in the country, Uttar Pradesh was faced with the task of providing training urgently to scores of millions of youth. He underlined the various initiatives undertaken by the state in this context. Of the nearly 1.3 bn people in India, nearly 65 percent are in the working age range (15-64 years) and almost half of the total population (about 650 million people) are under the age of 24 years. It is this last group that needs skills to be employable and needs them urgently. It is estimated that by 2030, Indians will account for 28 pc of world’s working age population and hence with a proper education and skills training, Indian youth could find opportunities to fill in the increasing gaps in manpower in several developed economies around the world. However, this is where the challenge for India lies. Currently, only two pc of youth are trained in vocational skills. Moreover, due to a mismatch between the education provided and the skills demanded by industries, millions of students, though having enough credentials, are deemed inadequate for jobs. Taking into account the need of the Indian skilled workforce, the objectives and challenges to execute the Skill India programme were discussed with an aim to improve the mobility of Indian workers and the alignment of national skills development efforts with international labour market requirements. Therefore, advancing Prime Minister Narendra Modi’s ‘Skill India’ mission to empower the youth of the country with appropriate skills to make them more employable and productive in the work environment, EIFE has organised the ‘First India International Skill Development Summit’ in New Delhi from November 21-23, with a motive to provide a space for the EU and India for vibrant discussions. With over 400 participants, from India and the EU, expected to gather for the conference, the EIFE hopes to help Indian policy makers and private skilling institutions understand the approach of European Union in skill development and to help India improve its skilling methods and know-how. Also, it is an opportunity for Indian delegates and institutions responsible for skill development to convey the challenges that lay in way to skill the youth of the nation in order to increase their knowledge, capabilities and employability as a whole. “The EU institutions have been selected keeping in mind the requirements of Indian economy, today and tomorrow. We have done a lot of scouting and mapping the terrain in India to understand the requirements of its industry and accordingly, we have lined up those very institutions from the EU who have the capacity and the desire to work with India and help the Skill India mission,” says Count Christopher de Breza, the founder chairman of the EIFE. “The immediate requirements of India are for the EU institutions to suggest and assist in formulating strategies and progressive curriculum for Training the Trainer, content of curriculum formulation, certification up-gradation, overseas internship and exchange programs, and technology transfer among others, and fill in the loopholes in the existing training system and ameliorate the youth performance by providing them with appropriate training,’’ adds Samrat Garg, Country Head, of EIFE in India. “The summit is expected to yield some concrete conclusions and decisions that will help India lead its youth towards betterment and hence a developed nation,” concludes Count de Breza. These events will act as a rostrum to build the gap that exists between the education that is being imparted in India currently and the training that is actually required for the youth to be employable by industry. The objective of these events is to bring under one roof various governments, private sector and civil society players of India to rapidly build up a vibrant skill development partnership with those European countries, companies & institutes who have an expertise in this sector. The founders of EIFE understand that this vision cannot be turned into reality in a jiffy and that it will take years. “We began in 2014 and the outcome until now has been beyond our expectation. With participation from institutes from Germany, Switzerland, France and Belgium as well as representatives of various Indian states – intellectually everything is very exciting,” says Count de Breza. He also propounds that India is one of the biggest resources of skill development for the more developed countries and gradually he eyes almost all the European countries to come forward and participate in this mutually beneficial relationship. 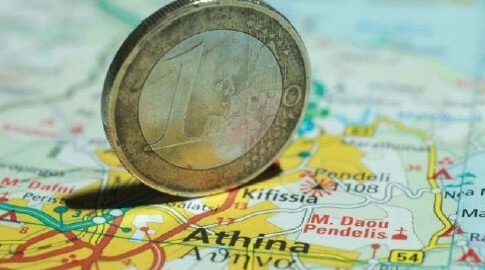 With principal partners like OECD (Organisation for Economic Cooperation and Development) and UNESCO, EIFE becomes the only organisation aimed at serving the picture at large. Switzerland-based International Labour Organisation (ILO) and New Delhi-based National Skill Development Corporation (NSDC) are the other key knowledge partners for the Paris event that can bring a meaningful perspective to the mission at large. But it is hardly a smooth ride. Count de Breza acknowledges there would be numerous challenges on the road ahead. These could stem from differences in cultures and work ethics as well as starkly different education and training systems between India and the EU as well as different standards of education and skills. requirements of Indian businesses, educational institutions as well as the Indian Government, EIFE invites all stakeholders – Indian or European — to become a partner in the EU India skill development initiatives and continue on this long and win-win journey which will not only enhance the skills sector in India but also a once in a life-time business opportunity for all our partners.